The new digital compact cameras ST500 and ST550 record HD video in 1280x720p resolution at 30 frames per second in H.264 format. The ST550 also features HDMI connectivity via an optional adapter, so you can see your HD video creations in glorious HD on an HD TV. The ST550 and ST500 are expected to be available in the US in September 2009 at a suggested price of $349.99 (Rs. 16,867) and $299.99 (Rs. 14,457) respectively. What's special about them is that they help you take self-pictures - thanks to its dual LCD (one each at the front and back). The ST550 and ST500 are the two camera models that will feature this technology. 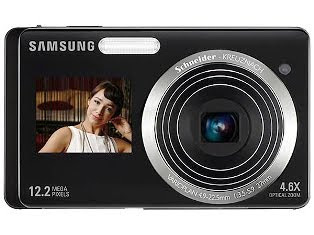 Both cameras feature a 12.3 megapixel sensor and a 27mm wide angle Schneider Kreuznach lens with 4.6x optical zoom. The 1.5-inch TFT LCD located on the front of the camera is common to both camera models. This display can be used for shooting self, with self-timer, for shutter info, function info as well as children modes. In fact, while taking self shots, there is no need to even press the shutter button just a big smile will trigger the cameras to take the picture, says Samsung. At the back, the ST550 features a 3.5-inch wide touch screen LCD while ST500 comes with a 3-inch Wide LCD. The touchscreen LCDs on the camera rear feature Smart Gesture User Interface technology, enabling users to tap and browse through features.